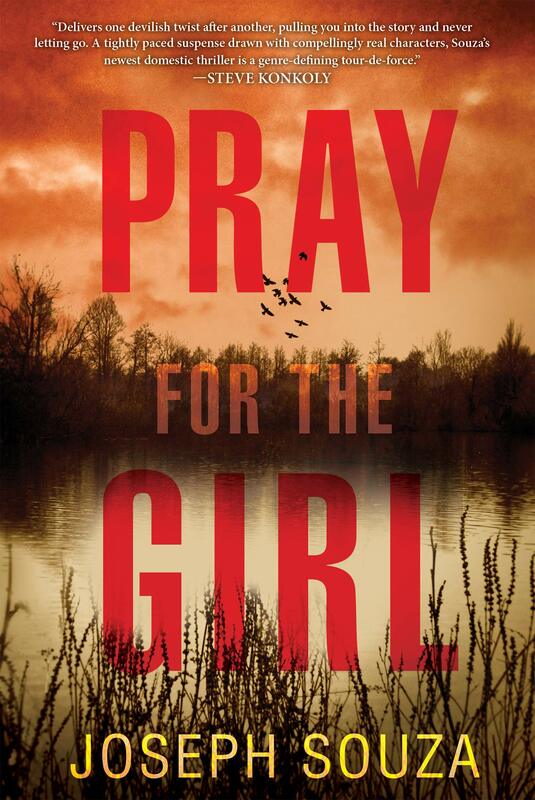 Where does one even begin to review a book like Joseph Souza’s Pray for the Girl? And how can any in-depth analysis not reveal one of its major plot twists? And believe me, there are many jaw-droppers here. Souza’s novel follows many of the standard modern murder mystery tropes, but’s it’s all told from the point of view of a protagonist unlike any other. Lucy Abbott is a veteran of the Afghan War, both emotionally and physically scarred by her experiences and haunted by the death of a young girl she couldn’t save while stationed there. After a stint in New York City where she honed her culinary skills as a way to avoid dealing with her PTSD and other issues, she returns home to Fawn Grove, Maine to help her ailing sister only to find the once proud mill town economically devastated and tensions rising between the townies and recent influx of Afghan refugees. When a young Afghan girl (like the girl Lucy couldn’t save in the war) is found buried up to her head and stoned to death, Lucy takes on the classic role of amateur detective as a way to wrestle her own demons and find redemption, she hopes for both herself and her town. In Lucy Abbott, Souza has created an unforgettable character who is tortured, complex, and tough as nails. Her PTSD only scratches the surface of what she’s been through and amplifies the conflicts she’s had with her own identity all her life. The novel is told in first-person narration from her perspective. Sometimes this can be an overused narrative tactic when the narrator magically knows everything about everybody. But Souza is extremely clever with Lucy’s narration. She’s often as in the dark about her own true motives as she is about the motives of those she observes. As she grapples with ghosts from her past and the troubled individuals in her hometown, her deep insights into her own psychology and the conflicts of those around her are believable and fitting given how much she has been through, which is all slowly revealed to maximize suspense. Souza writes very believable dialogue, and as is the case with first-person narrated mysteries, it often has to provide exposition when the narrator would not otherwise be able to find out details about certain characters and events. He does a great job balancing realistic character chatter with expository reveals. Everyone has a secret to hide in Fawn Grove, and it’s easy to see why someone like Lucy could sidle-up to them as a confidant. There’s a major (and sometimes overextended) subplot involving the town’s once famed but now in-the-dumps diner, The Galaxy, and how Lucy gets it in her to mind to salvage it with her culinary skills. Having worked in a Greek-owned diner as a youth, I found this subplot entertaining, though some readers might find it dull filler. Not surprisingly, the diner becomes a crucial location for character interactions and plot reveals. Later in the novel, someone’s alter ego, Iggy, gets involved with characters at the diner in ways that almost take the book completely off the rails, but Souza is able to get things back on track before the reader has any time to question the believability of Iggy’s exploits. Souza is mostly successful with his plot twists. The big twist concerning Lucy is deftly handled. Because of how well he builds her character, it doesn’t come across as a twist created to simply serve the plot or shock the audience. The more classic “who-dun-it” reveals are a mixed bag and come so fast at the end as to make the reader’s head spin. However, each and every one of the twists only adds to the color of Lucy’s experiences and her ultimate redemption. Despite my mostly minor quibbles, Pray for the Girl easily earns my most enthusiastic recommendation. Through the unforgettable character of Lucy Abbott, Souza is able to turn many of the genre’s clichés on their heads and explore issues of modern warfare, identity politics, and small-town decay while weaving a smoldering commentary on the American Dream. America has always been a place for misfits like Lucy and immigrants like the Afghan refugees, but as those groups evolve and change, those who came before them can become especially susceptible to feelings of fear toward the “other” that turns into hatred when faced with the economic and moral collapse of their once proud communities. Souza more often than not humanizes rather than exploits these tensions, even as he fits them ever so neatly into a nifty and wild murder mystery that will keep readers up into the wee hours of the morning wondering how it will all end. Note: I received an advanced review copy through NetGalley. Pray for the Girl will be released on April 30th, 2019. This entry was posted in Book Reviews, Books, Psychology, Spotlight on the Independent Arts and tagged Afghan Refugees, Fawn Grove, Joseph Souza, Lucy Abbott, Maine, Murder Mystery, Plot Twists, Pray for the Girl, Psychological Thrillers, PTSD, Unforgettable Characters. I agree David. A complex thriller that never relieves in tension. I read an ARC recently and will be posting my own review shortly. Glad to see us on the same page with this one, John. I’ve scheduled your review to post on Twitter on the release day. Good review. This sounds like a wonderful book. Thanks, Meredith – I think you would find a lot of juicy stuff to mull over with this one.